Posted on Sun 10 Sep 2006 at 6:37 PM PST. Filed under Entertainment. We drove north to Sacramento today and we celebrated along many fans the 40th Anniversary of Star Trek, with Leonard Nimoy & William Shatner driving the show. Each actor had a monologue — I loved how sharp Nimoy is and how full of joy Shatner is at their 75+ years of age. 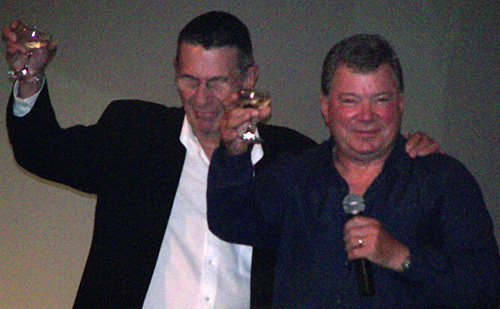 The two actors later got together on stage (it was great to see how good friends they have been all these years) with Shatner toasting some champagne saying “here’s to another 40 years…“. Later I found myself next to Nimoy for a picture together. His ‘Mr. Spock’ character has influenced me over the years, especially in my early life. Today was a good day. I don’t have it yet. I will take hold of my picture with Nimoy in 15 days or so (the organizing venue will mail it to me). Will you post your pictures too ? >Will you post your pictures too? As for my pic with Nimoy I will post it when I get it, but only if I don’t look like a dork.